Mazda CX9, a crossover that plays with the big boys. BOTTOM LINE: The GMC Terrain, and its Chevrolet brother the Equinox, are good-sized SUVs with a host of good features. The Terrain has a surprise or two, though. It took me a while before I fully realized that the GMC Terrain I was driving had diesel power. I recall the days when a diesel-engineered car had a certain rattle. In fact, we have a neighbor in an older Mercedes-Benz diesel that I can hear coming from a block away. But the Terrain diesel is gasoline-engine quiet. Not that it’s silent, mind you, but the traditional diesel rattle is gone. Our tester was powered by a 1.5-liter turbocharged diesel that pumps out 137 horsepower at a low 3,750 rpm and a healthy 240 lb.-ft. of torque at 2,000 rpm. Therefore, performance is decent, if not spectacular. 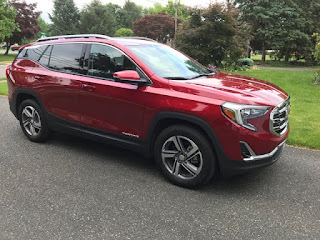 As empty-nesters, my wife and I have no outstanding need for a SUV, so the Terrain’s compact size would fit the bill. Ride quality is almost sedan-like and its overall size isn’t too large. Yet, for those occasions when we would want to carry stuff, as when headed to or from our daughters’ houses, there is plenty of cargo capacity. The numbers are 29.6 cubic feet of cargo with all the seats up and 63.3 cubic feet with the second-row seats down. This would be a great vehicle for carrying a golfing foursome and all their gear, for example. What sets the Terrain apart from any other vehicle I have driven is its gear selection process. No “three on the tree” or T-shaped handle in the center of the console, the Terrain is equipped with five buttons at the base of the center stack. Now, these aren’t all normal pushbuttons. 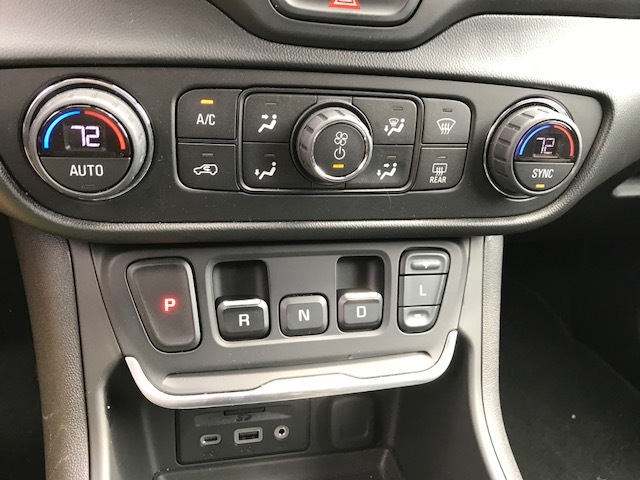 Park and Neutral are pushbuttons, but reverse and drive are “pull buttons.” In addition, there is a low with + and - for semi-manual shifting. Shifting using these buttons requires some thought, but it reduces the possibility of engaging the wrong gear. I liked the arrangement, but a consensus of people I spoke with indicated a love-hate relationship. You gotta try it. Ride quality is good. The terrain handles well on twisting roads with minimal lean. The suspension is firm, but not hard. The driver faces a clear instrument panel with some novel features. One is the rear seat warning that we have encountered in other GM vehicles. If you open the back doors for any reason, when you later shut off the Terrain an alert sounds, and a message appears one the dash to check the back seats. This is a good idea, because we have left food there, and it’s a good reminder if you have children in the back. We set the IP. up with a digital speedometer alongside digital analog gauges. The default infotainment screen is audio on the left, and a map on the right, with a digital clock and outside temperature along the bottom. Most infotainment screens turn blank when you shut them off, but this one retains the clock and outside temp. GM’s IntelliLink infotainment system is set up for Android Auto and Apple Car Play compatibility. At the base of the center stack, below the shifters, is a large cubby with USB and AUX outlets. 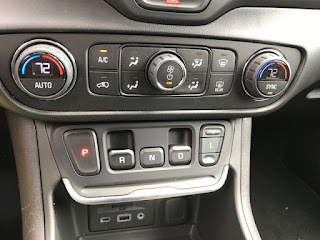 four wheel drive controls are located on the center console along with the heated or cooled seat switches that we didn’t check in warm weather. Front doors have multiple storage that includes bottoms to the door pulls, a small cubby underneath the door pulls and a larger one at the bottom that’s good for water bottles. The GMC Terrain is a solid package with good cargo capacity and a decent sized exterior profile. The diesel engine is a plus. A first look at the 2019 Chevy Blazer!! Chevrolet is reviving the Blazer, not as a workhorse SUV but now as part of a lineup of crossovers. Bumper2Bumpertv has a first look at the restyled and reengineered classic. 2019 Ram Laramie 4x4, a first drive. The battle for supremacy in the light truck segment is heating up with the 2019 Ram 1500 series. Bumper2Bumpertv has a first look and drive with the unit which offers equal amounts of performance and technology. CARGO CAPACITY: 13.0 cu. ft.
BOTTOM LINE: The BMW 330e is a typical BMW 3-Series with a plug-in hybrid feature. However, the electric range is minuscule and almost useless. Every manufacturer, it seems, is getting on the electric bandwagon. BMW is no exception. The Bavarian manufacturer has a couple of electric vehicles in the i3 and i8, but they also offer the hybrid electric 330e, our tester. While the 87 horsepower electric engine adds important horsepower and torque, especially for acceleration, plugging it in every night really seems a waster. It takes 6-7 hours to fully recharge from empty using a house 110-volt outlet, and that only yields 14 miles of pure electric driving. Other pure electric cars can exceed 200 miles range, and compared to them, 14 miles is a pittance. But it is a start. Of course, the batteries in the 330e also have another function. The twin turbo 2.0-liter four in the 330 produces 180 horsepower. 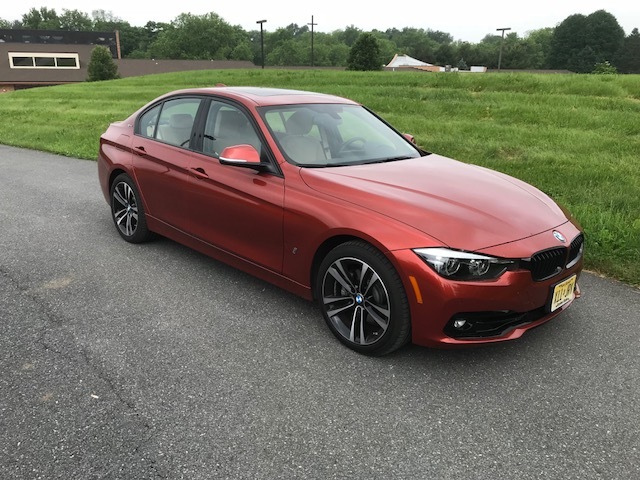 However, if the need arises, you can punch the accelerator and gain additional horsepower and torque for stirring acceleration, and that’s fun. Handling is BMW good. We took the 330e over our favorite twisty hill climb route and thoroughly enjoyed the experience. In fact, we were enjoying it too much when I noticed I was getting to close to a car in front, that I never even saw at the bottom of the hill. I had to back off. The suspension is compliant. The 330e handles curves well without subjecting the passengers to kidney-jarring firmness. This is a BMW hallmark. Overall ride quality is very good. We were aided by shifting to the Steptronic (manual) side of the 8-speed automatic and used the wheel-mounted paddles to up- and downshift. Front seats are comfortable with good support in the kidney area. There are also seat extensions to support your thighs. Rear seat legroom is tight. Rear passengers have their own HVAC controls and a pair of cupholders in the pull-down armrest. Drivers can choose from three BMW eDrive-specific programs - AUTO eDRIVE, MAX eDrive and SAVE BATTERY - by using the eDrive button in the center console. These settings allow the plug-in hybrid drive system to be adapted to the way the car is being used at any point in time. There’s a clear instrument panel with round gauges. The default for the infotainment screen has three mini-screens - media/radio, communication and navigation. This way the passengers can have the music they enjoy and still know where they’re going. Along with the excellent HVAC system there is good entertainment with the main selector knob in the center console controlling all functions. The pair of cupholders at the base of the center stack is sometimes inconvenient, especially for taller cups. There’s also a very good trunk for a small car. Overall, the BMW 330e is a very nice car. Being a BMW defines that part. I was disappointed with the all-electric range, though. 2018 Hyundai Accent, going against the trend. Why would anyone want a small subcompact sedan these days? Hyundai thinks there is a place for such a vehicle not only in North America but around the globe. Bumper2Bumpertv kept that in mind when checking out the latest version of the Accent. Red and ready to run, the 2018 Infiniti Q60 Red Sport 400. A sport coupe with some serious performance chops, is the best way to describe the Infiniti Q60 Red Sport 400. Bumper2Bumpertv got some seat time in one and enjoyed every minute of the experience. LENGTH X WIDTH X HEIGHT: 198.3 x 78.3 x 70.0 in. 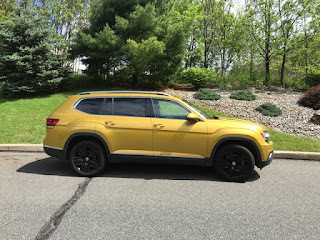 BOTTOM LINE: The all-new Volkswagen Atlas is smooth-riding and relatively quiet for a good-sized sport utility. Recently introduced, the Volkswagen Atlas is the big boy of VW’s SUV family, joining the Tiguan. Of course, there are several Audi SUVs as well, making for a lot of utility coming out of Germany, or Chattanooga in the case of the Atlas. Once I got over the initial shock of the color, the Atlas proved itself to be capable, quiet and good-handling. But the color. It was a love-hate choice among all the people we spoke with. VW calls it Kurkuma Yellow metallic. Before you start rushing to your dictionary, Kurkuma is a yellow-barked tree and VW decided to emulate it. At least it was easy to find in a parking lot. Atlas is powered by VW’s narrow-angle V6 engine, driving all the wheels through an 8-speed automatic transmission. The engine is peacefully quiet and gives more than adequate performance. Economy is modest, however, but one usually doesn’t buy an SUV expecting great economy. Atlas is a nice package overall. There’s tons of room for passengers and cargo. The third row lowers easily for additional cargo space, but when it’s up it offers decent legroom. There’s very good legroom in the second row as well, and access to the third row is easy. We had issues with the HVAC system. It’s fine when it’s really hot outside and you need maximum air. However, the fan is noisy, even at low speed, and getting the system to settle in at a comfortable temperature is a challenge. We would find a comfort level, then have to turn it off and repeat. In fact, the fan is noisier than the engine. I’m a bug about utility in SUVs, and the Atlas passes the test. For example, there’s a huge arm rest/console, and a large cubby at the base the center stack. There’s large storage in the doors. And there’s a good-sized tray at the top of the dash. Unfortunately, this tray has a slippery surface that reduces its utility. In the tastefully designed dash there is a clear instrument panel with a lot of information. Among the information I especially liked is the overhead view when backing up and parking. It gives a great idea of where your vehicle is relative to other vehicles, concrete curbs and other “invisible” obstacles. Another issue we had was with the panels on the doors that hold the window and mirror controls. This panel tends to get wet in the rain (when you open doors, etc.) and ends up with water spots on it after drying. It’s not a serious problem, just an aesthetic issue. Front seats are comfortable and in our tester were heated and cooled. Second row seats offer, as I said, excellent legroom plus outside visibility. There are fold-down arm rests toward the center of the car in the second row seats, with cupholders in the doors. There are a pair of USB outlets plus a 115-volt outlet at the rear of the center console. Second row seats have pull-up window shades that my granddaughters loved. Atlas is a new SUV for Volkswagen and it is a good size with good features. Our tester had a couple of quirks, but overall it was a good ride.